"From school lunches to an office snack, these low carb Cucumber Turkey Roll-ups will quickly become a favorite protein-packed snack." Using a vegetable peeler or mandolin, peel the cucumber into thin sliced strips. Slice Dietz & Watson Originals Turkey breast into thin sliced strips. Slice Dietz & Watson Originals Cheddar Cheese into 1/2 inch sliced strips. Layer one slice of D&W Turkey, folded in half, and two D&W Cheese pieces onto cucumber slices. 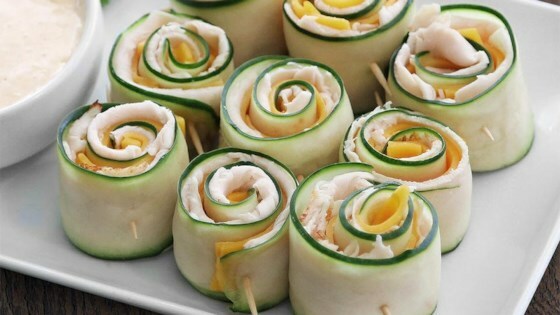 Roll cucumber and place toothpick in the middle to hold the roll together. Serve with Ranch Veggie Dip for dipping.